In April, Peter Roeman Hansen wrote to me asking if I’d participate in his upcoming conference, European Cities Marketing International Conference. He knew that the focus of GenderAvenger was highly relevant, since the attendees represented the bulk of the meeting industry, conference destinations, in Europe. Thus, my Scandinavian adventure began. My hotel was in Copenhagen, Denmark, but I had to venture to Malmo, Sweden for the conference. Imagine my surprise when, at the border, I was kindly escorted out of Sweden because I had shown up without my passport. After checking me out, the border guards gave me paperwork that allowed me to return to Denmark to retrieve my passport. One friendly guard stayed with me until I got on the train back to Denmark and a second guard boarded the train with me. I was told that, while the Danes were lax about border crossings, the Swedes were not, so I had to laugh when I returned, passport in hand, only to find the entrance to the station unguarded! I was sorry to have missed the “101 Ideas for Better Tourism” session I had planned to attend, but I came armed with the 102nd idea, and it turned out to be a hit. During my session, titled "#yourconferencetoo", Peter used two pieces of technology that truly enhanced my talk. What is my opinion on femanels (all women panels)? Isn’t it a matter of competency? Aren’t there manels (all -male panels) because there are not enough ‘prepared women’? How can municipalities get involved? The second technology that enhanced my talk, oddly enough, was my microphone. Peter gave me a headset rather than a clip-on mic so I didn’t have to spend any time wondering if the added weight on my shirt would cause a wardrobe malfunction. Conference organizers, you may want to consider having mic options available for the women speaking. If these European city marketers clearly get the need for gender balance, surely we can convince America’s mayors and city councils to join in. 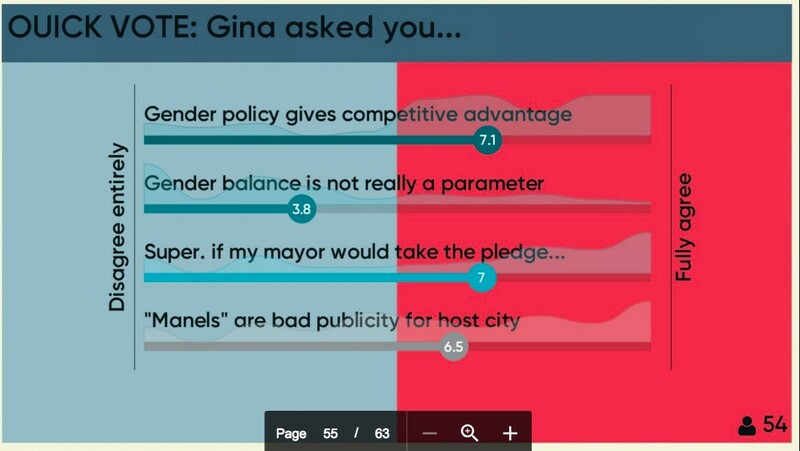 For example, the happenings around the Boston BIO International Convention provided the perfect narrative to show how important it is for city leaders to pay attention to gender balance at public events they host. Two weeks after MassBio released their policy statement on gender balance at conferences, the BIO conference landed in Boston with awful gender balance, including a whopping 25 manels. The press coverage, by four to one, featured stories about BIO’s indifference to the value of women’s voices, which was further compounded by the allied event featuring women with corporate logos emblazoned on their bare breasts. The negative coverage overshadowed any positive press the conference may have created about tourism in Boston in the aftermath of GenderAvenger and GenderAvenger Massachusetts actions. The one article about what a wonderful city Boston is was literally papered over by the rest of the conference’s missteps. If only BIO International had created a policy akin to MassBio’s new policy to prohibit “all-male panels at MassBio programs, forums, and conferences, along with those events MassBio representatives participate in”, coverage of the BIO event and the city of Boston may have been much more favorable. GenderAvenger Massachusetts is already working on a policy for the city of Boston to solve this problem in the future. How about signing up your city? Need help? We have a short, four-slide presentation you can use to promote this practical, timely, and much-needed solution. When the leaders of your cities sign on to support better tourism through gender-balanced conferences, please let us know so we can see and celebrate the civic leaders who know where the future is headed.